If your blinds aren't becoming to you, they should be coming to us! With Bloomin’ Blinds of Charlotte, NC, you can find beautiful, affordable, and practical solutions to all your window covering needs. Whether you’re looking to amp up the drama of your living room with bold plantation shutters, or simply want to provide a greater level of privacy in your office with faux wood blinds, our Charlotte blinds company has the answer. With hundreds of styles from leading brands—all at affordable prices and backed by our limited lifetime warranty—you’re guaranteed to find just the right new style. We also specialize in lasting repairs for your blinds, shutters, and shades, so you can protect your existing window treatments and extend their lifetime. Curtains & Company is your one-stop source for all your interior design and home décor needs. We specialize in custom made window shades, shutters, woven woods, roman shades, bedding, and upholstery. We have locally owned offices that provide a great alternative to big box stores and national chains that carry products imported from other countries and handle installation and service with subcontractors. 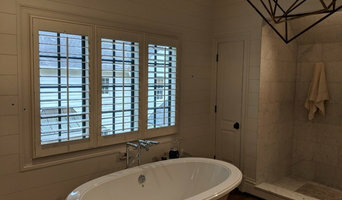 We provide quality, value and service with locally-fabricated plantation shutters, custom closets , and other products purchased from top American manufacturers. Why Choose Us? • Trust - over 23 years of experience with an A+ rating from the Better Business Bureau • Made in the USA - locally owned and operated! • Free in-home/office design consultations and estimates • Fast delivery – our shutters can be custom made and installed in as little as 10 days! • Limited life time warranty on our hand-crafted shutters, 5 to 10 years manufacturer warranty on blinds and shades • Employee installers - no subcontractors • Unmatched value, integrity, and service Our Product Consultants have the talent and experience to help you reach your objectives for budget and functionality. We offer FREE estimates and consultations without any pressure or obligation if you do not like the options or solutions we develop. We custom-make all orders and guarantee your complete satisfaction. 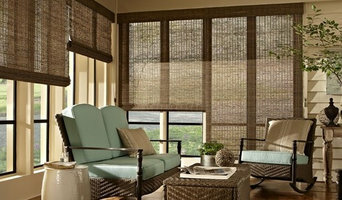 Charlotte Shutter and Blind Company offers a wide variety of window treatment options. Our goal is to help you provide you with privacy, some protection and overall aesthetics throughout your home. Experience the Elite Advantage! At Elite, customer service & satisfaction is truly our top priority! You will work directly with seasoned professionals who will not only listen to your needs but will support you by designing & installing the perfect custom fit shutters for your home. Elite Shutters & Blinds, Inc. is a full service manufacturer & installation provider of custom window treatments. 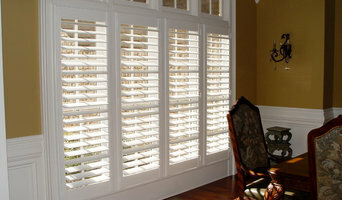 We specialize in our own line of custom interior plantation shutters and exterior shutters. In addition, we offer many well known national brands of interior & exterior shades, wood blinds & faux wood blind products. We have expertise in just about every soft and hard window treatment available. Meet Darrell & Tiffany Dean, owners and operators of Elite Shutters & Blinds. If you are looking for a true expert to guide your shutter purchase, Darrell is the best! Darrell has been working in the shutter industry since 1992. As a designer and craftsman of custom shutters for more than 20 years, there is no project beyond his expertise. "I was never interested in becoming the biggest shutter company, just the best that I possibly could be. My philosophy is to educate each client and never try to 'sell' anyone my products. My clients can tell you, there are very distinct differences between the companies within this industry. That's why I still meet personally with so many of my clients to this day." With a BFA in design, Tiffany brings more than 20 years of experience in design to Elite clients. Her gentle and warm personality puts our clients at ease and her professional design capabilities supports our clients in creating the perfect fit for their home. "I love working with my clients to help them to create the right atmosphere for their home. My philosophy is to listen first, then offer what my clients need, not what I want to 'sell'. When I work with clients, I offer my expertise in design with the goal of supporting them in selecting the products that they will love for years to come!" At Elite, we build relationships with our clients by partnering with them. We focus on the personal attention they deserve and the attention to detail they expect. We can proudly say that once people have experienced the Elite Advantage, they are clients for life. Custom Window Treatments, Inc. is a high end fabricator of window treatments, bedding, pillows, etc. to the design trade. Located in the Mint Hill area of Charlotte, NC for 20 years in 2400 sq ft of space, our staff of eight experienced seamstresses can make any treatment presented to them, no matter how intricate or how simple. We can make your designs come to life. We use the finished English Bump Interlining along with intermediate grades of English Interlining and levels of flannel interlining. Cotton sateen linings in many colors are offered including blues such as sea quartz, putty, khaki, grays, whites and off white. We offer custom hand painted wood finished hardware in many sizes and styles in finishes including gold leaf, silver leaf, tortoise shell, bamboo, stained, painted and glazed and many more along with a beautiful collection of brackets and finials to bring an artistic finish to your designs. Budget Blinds of Charlotte has been family owned and operated since 2003. For the past 12 years, owners Mark and Linda Paulson have been proud to be a part of the #1 company for custom blind and window coverings in America. With many years of experience under their belt, Mark and Linda work diligently and efficiently to ensure that their customers’ hard-earned dollars obtain a beautiful window treatment with a top quality product. Owners Mark and Linda were pleased to welcome their two sons, Kyle and Kevin Paulson, to the Budget Blinds of Charlotte team in January 2015. Kyle is our Sales Director and comes to us with 8 years of sales experience. He brings a fresh perspective to our team and is always striving for a remarkable experience for our customers. Kevin is our Operations Manager and also the co-owner of Budget Blinds of South Charlotte. He has served in the Marine Corps for the past 4 years, which has equipped and prepared him in many ways to achieve his future career goals. Kevin knows the value of hard work and excellent service. OORAH! Our convenient shop-at-home service for window coverings and home décor accessories has grown to include exclusive brands and products like our Inspired Drapes Collection and BB Commercial Solutions. As part of the Budget Blinds network, we offer homeowners the unique combination of incredible buying power, free in-home design consultation, professional installation, expert measuring, and quality, name-brand window treatments. Since its founding, we at Budget Blinds Serving Gaston and York Counties have proudly served the local community by offering high quality and stylish window coverings for any occasion. Our goal is simple: to provide you with the best products and services in order to enrich your home environment. Our lavish selection of window treatments includes shutters, blinds, draperies, shades and even window film. Regardless of the window’s size or shape, you can rest assured Budget Blinds will have a customized window coverings solution ready for you. Come visit our new showroom located at 3826 South New Hope Rd., Suite 10 in Gastonia, North Carolina In 2014, Budget Blinds, in partnership with Springs Window Fashions, became the official window coverings supplier for Homes for Our Troops (HFOT), a privately funded 501(c) (3) nonprofit organization that builds and donates specially adapted custom homes nationwide for severely injured post-9/11 Veterans. Through this partnership we provide custom window coverings and measuring and installation services in every home they build, as well as providing an annual monetary donation of $50,000 to the organization. With over 20 years of experience, A Shade Above, together with our parent company Artisan Shutter, are the Charlotte area’s largest family owned and operated window coverings company. We only offer top of the line products and unsurpassed service. We are the only window coverings business in the Charlotte area with two convenient showroom locations. The showroom experience allows you to touch materials, see the mechanics and talk to an expert face to face. Consultant, Retailer and Installation of Custom Window Treatments Previously known as "Gotcha Covered of Lake Norman"
Hanging In Style Designs, Inc./Jacquelyn Weber, Associate ASID is a full service design company specializing in color consultation, remodeling, beautiful window treatments, bedding, and accessories for the home. We offer blinds, shutters and custom made products. We are also proud to be a Houzz 2013, 2014, 2015 and 2016 winner! I've owned my own Interior Design business for over 30 years. I graduated from the University of Dayton and started my own interior design business when I was young. My family and I have traveled and lived all over the United States and I've been continuing to decorate! Its my passion! I do a variety of work and have an eye for design! I have an extensive background in design and my work has been recognized in many model homes! I have relationships with vendors such as Duralee, Hunter Douglas, Waverly Schumacher, Pindler, Fabricut, Surya Rugs, and I'm a member of Pottery Barns Design Program. I use my design expertise to help you create the perfect vision for your home! I've worked on every type of design project. I've helped build and decorate homes from the ground up, worked on various kitchen and bath remodels, selecting furniture for your home, window treatments, fabrics, wallpaper, paint, blinds, rugs, decor and even decorating homes for the holidays! Please feel free to reach out to me in regards to your next design project! I'd love to set up a consultation with you for your next project! Window Treatments Extraordinaire. Over 40 years of experience in high-end window treatments from plantation shutters to full house automation/motorization, we do it all. We specialize in making Happy Customers. Custom draperies; curtains, valances, cornices, shutters, shades & blinds.